So I tried another new look for my Sisterlocks. You know I can only do so much with them because I'm not as talented as my fellow loc wearers. This look was something I stumbled upon...and I actually liked it. 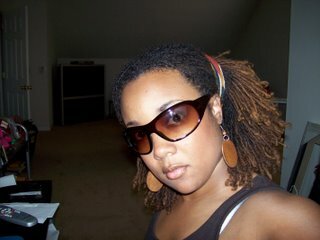 My locs are finally looking like locs and not "braids" as some have asked. But let me tell you, by the end of the day with this humidity in Atlanta my hair had gotten so thick up in the front that I had to move the scarf to the top of my hairline...lol. They are looking good girlfriend. Thanks! Your hair is looking good too! I thought it was a band. Cute. This is a cute look and you resemble my sister in this picture.